Though fall and baking go hand in hand, sometimes, its more comforting to bake whenever you want to, using whatever ingredients you have at hand. Just like this Upside down Peach and Cherry cake which was a great way to use the bag of stone fruits lying on my kitchen counter. Foodblogga's story behind his cake is much more interesting though, as its an adapted version of her grandma's 70-year old recipe! It's a fresh and colorful cake that will fill your house with a scintillating aroma, as the beautiful cake bakes in the oven. 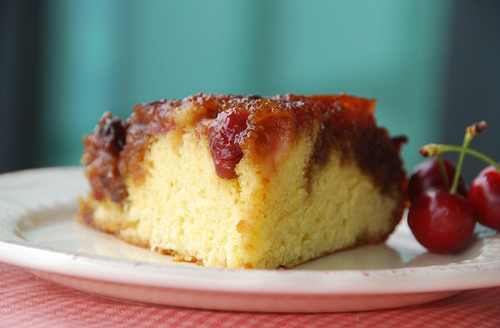 The peach and cherry compote that covers the cake will linger on your tastebuds long after the piece of cake is gone!